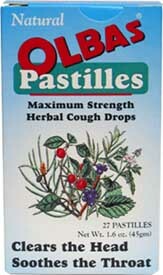 Long lasting and powerfully soothing, these potent cough drops will help you feel better during the long, cold winter when colds and the flu are easy to catch. Each box is 1.6 oz. and contains approximately 27 pastilles. $5.49 per package. From Anonymous of dfw, Texas on 1/24/2009 . just try chewing them i find it to be strangely enjoyable.